In this video and blog post, we discuss how to setup your NDI® HX camera from start to finish. If you have any questions please reach out to our support team. We believe this video will get you started right on the best path forward. We also include technical information about IP video networking and bandwidth considerations. Finally, at the end of this blog post we also include a 30 minute webinar dedicated to answering your questions. Step 1: When you first receive your PTZOptics NDI®| HX Enabled camera, the first thing you should do is read the included manual. A portion of this manual is dedicated to the NDI|HX Setup which you should pay specific attention to on page 45. Step 2: Inside your box you will find your camera, the manual, the power supply, a remote control, two AAA batteries and a serial connection cable used for joystick controllers. Step 3: Once you have read the manual, it is helpful to select the video resolution and frame rate you would like to use with your camera. The camera’s resolution is set by a yellow dial on the back Interface board of the camera. You can reference the available frame rates in your manual or on a table printed on the bottom of your camera. NOTE: The default dial setting is “0” which is 1080p60fps. This is ideal for sports but you may want to consider setting “6” for 1080p30fps for the classic natural video look depending your application. NOTE: Keep in mind the camera does have a “dial priority”setting inside the IP interface. This interface supports 50HZ(PAL) and 60HZ(NTSC) and Dial Priority (see rotary dial on camera) formats. 60Hz is used for North America. Step 4: Once you have set your resolution dial, can turn on your PTZOptics NDI® camera. If your network switch provides PoE (Power over Ethernet), you will not need to use the included power supply. NOTE: Cameras support PoE 802.3af. The camera via PoE consumes between 12 – 13 Watts; but at longer cable runs can require up to 15 Watts to accommodate for voltage drop. Step 5: When you are first getting setup it is helpful to connect your camera to an HDMI monitor, but you can also use the SDI output to view video from your camera as well. Step 6: Once your camera is powered on and connected to the network you should determine whether you will use a dynamic or static IP address. We highly suggest assigning your camera a static IP address for long term use. Note: A dynamic IP address can change periodically making it difficult to manage in the longer term. We suggest setting up static ip addresses with sequential IP addresses for tidy management of multiple cameras. NOTE: Most applications will require your NDI® camera and the receiving computer or device to be in the same subnet of the LAN (example – 192.168.1.123 & 192.168.1.111 belong to the same subnet; 192.168.1.123 & 192.168.0.125 do not). Step7: Let’s put the included AAA batteries inside our remote control and take a look at the features. You can pan, tilt and zoom your camera using the up/down/left/right arrow keys on your remote. You can also, set a specific PTZ camera preset by clicking the “preset” button and than entering the number you want to set. You can try moving the camera and calling a preset quickly to test out the cameras movement operations. If you find the default camera preset movements too fast, you can always change the speed settings in the camera menu. You can access the OSD Menu which stands for (On Screen Display) for this camera by pressing the “menu” button. This is where you can navigate into the advanced features such as iris, shutter speed, gain, color balance, contrast, luminance and much more with the arrow keys. Tip: You can access the OSD menu remotely using the cameras IP address in any web browser or with the IP joystick. Tip: You can control up to 4 cameras with a single IR remote control. Use the shortcut *# and the corresponding Function key to set up unique camera IDs on your IR remote. Example *#F2 would set a camera to ID 2 on your IR remote. Step 8: You can use DHCP to dynamically assign an IP address for your camera. This is a great way to temporarily assign an IP address to your camera. You can setup your camera with DHCP by using the IR Remote and entering “# > * > 4”. Once the camera reboots, you can use the IR remote to locate the dynamic IP address by pressing “* > # > 4”. Step 9: You can assign a static IP address to your NDI® HX camera using our Windows Only IP address settings tool, or with any Mac or PC computers web browser. Let’s use a web browser. Enter the IP address of your camera into your web-browser and press enter. when prompted enter the default username and password which is “admin / admin”. You may want to consider changing this default password in the admin area. Step 10: Navigate to the “Network” tab and choose “Fixed IP Address” from the very first drop down menu. You can now enter the static IP address you wish the camera to use and press “Apply.” You can now reboot your camera by clicking the “System” tab and clicking the “Reboot” button. Step 11: Now that your camera has a static IP address, it’s time to configure your NDI settings. By default, your NDI|HX camera has two or three preset settings (depending on your camera model) that you can choose from for a simple setup with NDI. You can choose between High / Medium / Low and click the “Apply” button and reboot the camera. NOTE: NDI stands for “Network Device Interface” and NDI® HX stand for “High-Efficiency Network Device Interface”. NDI features a combination of high quality video with low latency transmission that is ideal for live video production. NDI|HX is ideal for broadcast professionals adding NDI sources to an existing network that has not been originally designed for video production. Here are some example networks that are ideal for NDI|HX video sources. Tip: NDI|HX video sources are generally one-tenth of the bandwidth of full NDI sources. Let’s take a look at a bandwidth comparison chart. Tip: Network Bandwidth headroom recommendations can vary widely from 30% – 60% depending on what the network is utilized for. Please consult your network administrator before adding NDI sources to your local area network. Newtek suggests “NDI traffic should not take up more than 75% of the bandwidth of any network link.”. Step 12: It’s now time to make sure you have the latest NDI tools installed on your computer. The latest drivers can be downloaded here – https://www.newtek.com/ndihx/products/. Once you have downloaded and installed the latest NDI tool pack, you should reboot your computer. Step 13: With the latest NDI tool pack installed, it’s time to pull up your video feed and do some final testing. You can open up the NDI Studio monitor application and right click anywhere in the window to select from your available NDI sources. Select your camera and notice that you will have the ability to pan, tilt and zoom your camera. Step14: Your camera is now set up and working on your network. Remember each computer you want to use with NDI|HX sources will require the the latest NDI tool package to be installed. 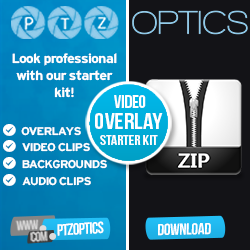 Step 15: Now that your camera is all setup consider downloading the free PTZ camera applications available at http://PTZOptics.com/apps. You can quickly tweak your camera’s settings and color match multiple cameras with advanced settings. The new apps available for both Mac and PC.